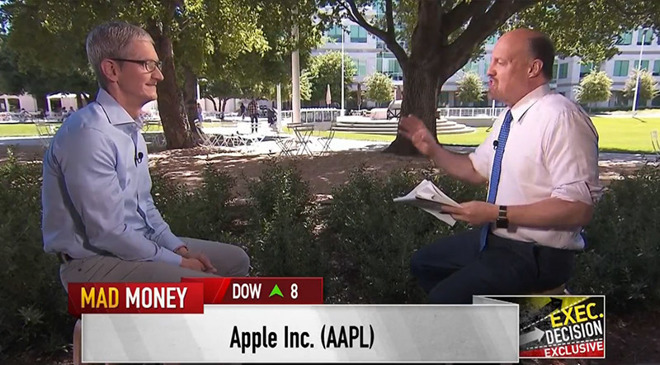 During a Wednesday interview with Jim Cramer, Apple CEO Tim Cook said the constant feedback and health monitoring functions provided by Apple Watch helped him lose 30 pounds. Cook's comments came on the back of a question about Apple's push into health and fitness, a segment that has evolved into a major area of interest for the iPhone maker over the past three years. Apple often cites survey results regarding Apple Watch customer satisfaction, pointing out owners are using the device as an effective health tracking tool. Asked whether he sees the same results, Cook said, "Yes, for me too, I've lost 30 pounds — partly to my watch." The Apple chief followed up with a rundown of Apple Watch's health and fitness features, highlighting the badge rewards system, as well as constant and instantaneous feedback via apps like Health. Apple Watch also assists in motivating wearers, Cook said. For example, the most recent release, Apple Watch Series 2, comes in a Nike+ edition that incorporates Nike Run Club reminders triggered by friends' shared activity, weather conditions or personal exercise history. "This makes a difference over time," Cook said. "And I'm getting calls and letters from so many people where the watch has made a difference in their life. And this is why we are in business. We're in business to help people achieve their objectives, to empower them to do great things." That message is apparently getting out to consumers. During an investor conference call recapping Apple's second fiscal quarter of 2017 on Tuesday, Cook said Apple Watch sales nearly doubled on a year-over-year basis. Apple has yet to divulge official sales data for the wrist-worn device, but said its "wearables" business — Apple Watch, AirPods and Beats headphones — was the size of a Fortune 500 company. For reference, Burlington Stores sits in the 500th spot on Fortune's list with revenues of $5.1 billion. As with any diet plan, the extent to which Apple Watch helped Cook achieve his goals is unquantifiable. The executive is already big on personal fitness — in a 2014 interview, Cook said he wakes up at 3:45 a.m. each day to read emails and work out. It is likely, however, that Apple Watch gave that extra bit of motivation Cook needed to reach his goals. Aside from Apple Watch, Cook also commented on other Apple initiatives, including potential Apple TV applications. "What we see is that the video world has kind of hit an air pocket," Cook said. "Where cord cutting has been happening on some kind of basis, we think it's accelerating massively. And it's clear what the end story looks like here, the trajectory is a debate, but we'd like to play in this." Along with nonlinear or on demand viewing, Cook believes consumers want to see additional information about the content they are watching in-stream. Services like Amazon Prime offer similar features in X-Ray for movies and TV shows, but Apple has yet to implement its own solution for Apple TV. Apple has long been rumored to launch its own over-the-top subscription service via Apple TV for years, but content owners and cable providers are not keen on ceding power to an industry newcomer.